PNP Bipolar Silicon Transistor has a power dissipation of 400mW. I(C) Max. of 800mA. 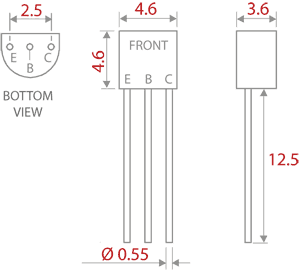 Small Signal Transistor, replaces MPS2907. 60V Collector Emitter Breakdown Voltage, 60V Collector Base Breakdown Voltage, 800mA Collector Current, 625mW Power, 300 DC Current Gain, 200MHz Transition frequency, TO-92 Case, Sourced from Process 63, Designed for Use as a General Purpose Amplifier and Switch Requiring Collector Currents to 500mA.